Previously, I explored the effect of 122 mm shells on German steel. Let's kick it up a notch with 152 mm! The ML-20 howitzer, mounted on the KV-1S chassis (SU-152) and an IS chassis (ISU-152), was meant to handle concrete bunkers and enemy emplacements with its massive high explosive charge. Turns out, it was quite effective against tanks too. The 152 mm tank destroyers were nicknamed "Zveroboy" (beast-killer) by the Soviets and "Dosenöffner" (can opener) by the Germans. Let's see how well it could handle German beasts. "Photo #37. Front of "Panther" tank. Direct hit by an AP shell from the 152 mm gun-howitzer. Breach in the armour 360 mm by 470 mm. Shell ricocheted. Distance: 1200 m"
The Panther's upper front plate is no match for the massive 152 mm shell. Despite ricocheting, the armour is breached anyway. Being in a tank that's hit by a shell that big, even if it doesn't penetrate, is no picnic. "Photo # 38. Turret of "Panther" tank. 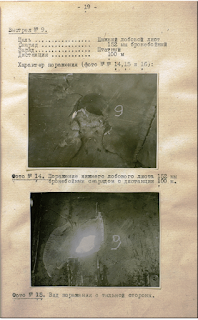 Direct hit from HE-fragmentation shell from the 152 mm gun-howitzer. Penetration, breach size 350 mm by 370 mm. The explosion of the shell forms breaches in the turret platform and the opposite side. Distance: 1200 m. Angle between the path of the shell and the hull is 60 degrees." As you can see, HE shells of that caliber are quite effective against tanks, as well as bunkers. In practice, AP shells for the ML-20 were infrequently used, as HE was more versatile. Next up is the Ferdinand. Not quite a "cat", but still a beast by one of its names (Elefant). "Photo # 39. Side of the "Ferdinand" assault gun. Penetration of a concrete piercing shell from the 152 mm gun-howitzer. Breach size is 220 mm by 230 mm. Distance: 1000 m."
"Photo #40. Front of the "Ferdinand" assault gun. Direct hit with an armour piercing shell from the 152 mm gun-howitzer. A piece 500 mm by 1000 mm from the front armour plate broke off. Distance: 1200 m."
Even the Ferdinand cannot withstand the firepower of the ML-20! Instead of leaving a hole in the armour, like a normal shell, the 152 mm AP just takes half of the plate with it on its journey into the enemy tank. Photo #41 shows the Ferdinand before meeting the ML-20. Photo #42 shows the Ferdinand after. As you can see, it's rather lacking in structural integrity, after only two hits. Sadly, I do not have any photos of tests against the Tiger, but I do have photos of tests against its successor, the Tiger II. The source is the same test as the D-25's article, CAMD RF 38-11377-129. "Shot #8. Target: upper front plate. Shell: 152 mm AP. Distance: 100 m.
Result: dent 190 mm by 270 mm, 60 mm deep. On the inside, a bump 10 mm high. Cracks formed, 500 mm and 400 mm in length. The welding seam between the left hull and upper front plate burst." Seems that 152 mm AP is not as effective as 122 mm AP was. Again, the poor welding seams make an appearance. "Shot #9. Target: lower front plate. Shell: 152 mm AP. Distance: 100 m.
Result: Penetration. Entrance hole: 260 mm by 175 mm. Exit hole: 85 mm by 160 mm. Narrowest part of the breach is 130 mm by 80 mm. A 320 mm by 190 mm section of armour was blown off on the inside. The break is clean, crystalline. Cracks running all the way through the armour, 300 mm, 280 mm, and 400 mm in length. Left hull weld seam burst on its perimeter. The majority of the shell remains outside the tank." This is some pretty massive damage. Poor quality armour shows up again, as evidenced by the clean separation of armour pieces. This penetration is amazing enough to deserve a picture in this article. Photo #14 shows the penetration on the outside. Photo #15 shows the penetration from the inside. By the way, since the majority of the shell was left in front of the armour, this doesn't count as a penetration by Soviet metrics. This shows how penetration tables can be misleading, and why practical testing should always be done when possible. "Shot ##10-11. Target: machine gun ball. Shell: 152 mm AP. Distance: 100 m.
Result: Penetration though the machine gun ball. The bolts fixing the ball in place are torn off. A crack through the armour plate, 210 mm long, formed. The left armoured bulkhead was torn off." Looks like aiming at weak points is just as effective in real life as it is in video games. Shooting at the side of the turret was even less fortunate for the Tiger II. Notice the size of the breach compared to the side of the turret. That is the exit breach. The AP shell penetrated both sides of the turret. In conclusion, the ML-20 is a potent weapon against even the toughest German tanks. The name of "beast-killer" is certainly deserved! To ask for a clarification....Wouldn't the side of the Ferdi simply collapse due to all the pummeling anyway? Also the front armour took two shots, although i don't see information on where the shells were aimed exactly. The fact that there was an open MG port would've helped the armour break too. Also, can you point to information about the first 7 shots against the KT. They would have played a role in cracking and unwelding, surely. Is there spalling info for the Ferdi ? Where there shots fired previously at the frontal armour of the Ferdi, before the 152's caved it in. There are a couple of dents visible. Again, just asking for clarification. I second the request for the asked clarification. Don't these tests serve to actually test German armour quality, rather than to test the guns themselves? The test is performed to determine if artillery system A can destroy enemy tank B. Whether this is due to the qualities of artillery system A or deficiencies of tank B is largely irrelevant. There was a discussion on the effectiveness of said artillery system(AP and HE). And they were difficult to determine considering the 152 is firing against an already pummeled Ferdi. Can the damage be attributed to the ML-20 or to the variety of hits before it , and the missing top plate. It is also unknown what contribution the previous shots to the frontal armour had to it being collapsed by the two 152 shots i.e how weakened was it. Also considering it was shot by D-25's several times before. Which didn't pen it, but the impact shock from 122mm shells certainly would've softened it up quite a lot. Not to mention the effect it would have on the welds. 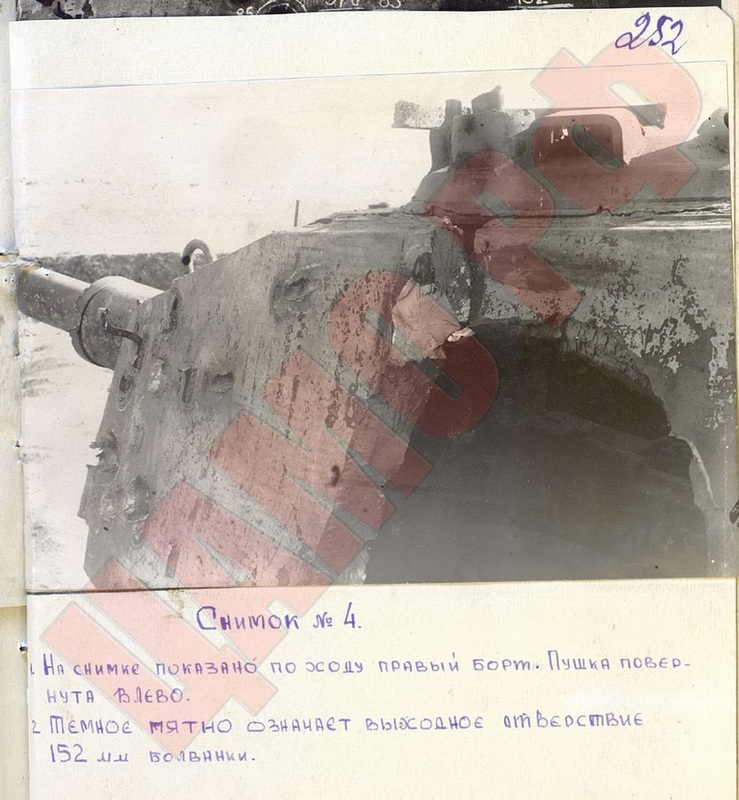 There is no info on how damaged the Ferdinand was when it was captured. There is also no information on what shot the Tiger 2 the first seven times unless this is the same KT that was blasted repeatedly by 122mm shown in another entry. Wasn't the Panther shot with a 122mm which blew out the back of its turret earlier ? Or is this a different tank. And are there test of the 152mm HE against thicker armour? There seems to be some information missing. Keep in mind, i'm not trying to troll or anything, but since there is information missing or withheld or whatever, i think it is necessary to confirm the validity of these articles and whether they can be used as legitimate examples in a discussion. OK, the Panther Tank is different from the 122mm tests. No mention of the damage to the German tank crews! I think the tanks were already knocked out when the tests were done (no crew). Still, for the tanks that were hit by these shells, the results would have been devastating for sure. I just noticed something the Panther being hit by a 152mm round in the front is a Panther D which means FHA Plate which = less resistance to overmatching projectiles. 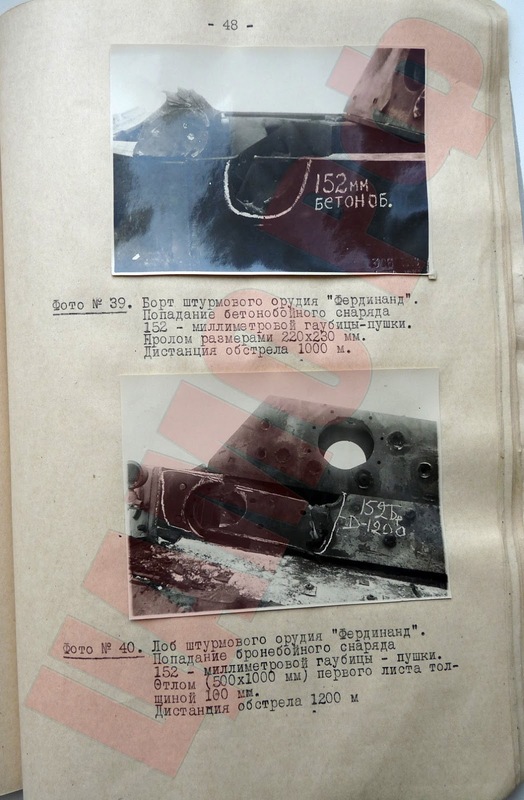 Secondly it looks like they shot at the letter box mg opening which most likely like the drivers hatch was removed before firing therefore the shot is not fair as it was shot at an already existing opening ( rectangular Mg hole) in the front of the tank.... Do you have anything regarding the IS-2 vs a late Panther ( preferably the G type)? The Red Army showed next to no interest in the Panther, I don't think it's likely that they would test another version of it, except as a way to test new AP shells. 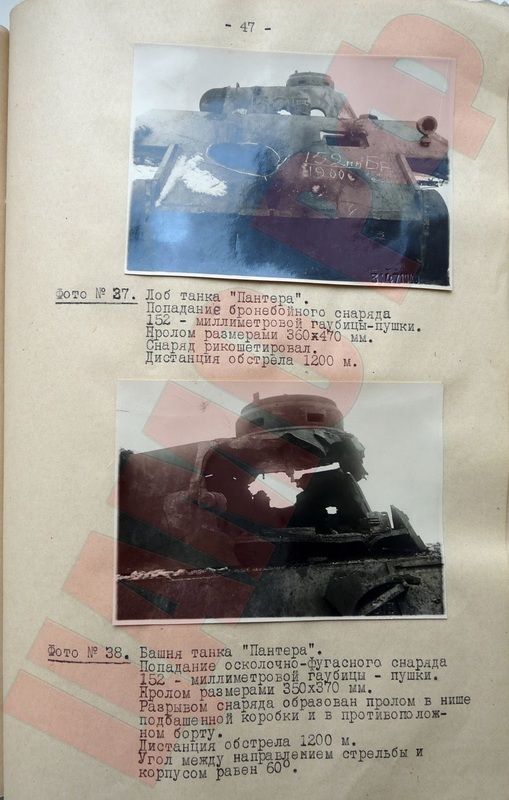 Well according to Mikhail's book ( the IS tanks) the USSR did shoot at a Panther ( not sure of variant but I would guess A) in Kurbinka in 1944 with the 122mm ( A-19 or D-25t) with disappointing results ( 600meter penetration of frontal armor does not specify if it was through the glacis) before the apparent loss of quality that is often cited.I haven't been able to find the said test so I know there are more out there. Dissapponting results, It wasnt cause better quality of german armour, but it was cause 122 mm amunition which was used. After test hardness of steel was increased, shape was changed and new ammo should penetrate Panthers hull at 2500mm. Apparently, none such improved ammunition did reach ww2 frontlines. 122mm APBC captured in the battlefields of Korea still had low grade steel with 100-118 BHN hardness without any signs of heat treatment from nose to base. The first reasonably manufactured soviet APCBC rounds appeared in the early 1950´s. Plus, the effect of improved projectiles is not relevant here and it cannot be expected to translate in a larger penetration range against PANTHER glacis. Striking the armoured slope at 55° - all projectiles will break up at such high obliquity, low grade or high grade steels. The impact weakness (Charpy test) and yield strength of the plate have significantly more importance at these obliquities than the shape or quality of the projectile. Face hardened plates (actually a form of Harveyized face hardening in ww2 tank armour) are at severe disadvantage compared to more ductile, homogenious plates. Not at all, the impressive bit is that the blast was powerful enough to penetrate the opposite side of the turret too. Only a idiot would believe this rubbish , What would anyone with a single functioning brain cell want to get into prior battle a T34 or Tiger , All the German Tanks look like they have been repeatedly shot at on a range at point blank range , In the field No Russian tank in actual combat could outclass a Tiger or Panther loss ratios prove this beyond any doubt , 10 - 1 for GD division , If you point a 16 inch battleship gun at a German tank you can say Look its destroyed its rubbish which is all the author of this rubbish is trying to say . That loss ratio is entirely fictional. And yes, if the ISU-152 had a 16 inch gun, that would be a valid test. A single Tiger was better then a single T-34 because it was made to be. A T-34 isn't gonna have nearly as many mechanical issues or cost as much as a tiger. Especially with the degrading quality of later German materials. You don't focus on purely quality when picking tanks for an army, nor do you focus on quantity, you balance both to get the best bang for your buck so you can have the most military strength for your amount of resources. This is a 152mm howitzer, as on ISU-152, for example. I'd rather be in an ISU than a Tiger. Also, due to production number disparity, I'd rather go through 35 T-34-85 than only get a single Tiger. Depends if you're in one of the multiple Soviet tanks that got brewed up with poor unsuspecting crews inside thinking uncle Joe is sending them to war in the ultimate tank. Compare the number of times the T-34-85 is touted as an ultimate invincible tank in its manual, versus the number of times this is done in the Tigerfibel. You will be surprised. Considering that this "rubbish" is not propaganda to tout the superiority of one's weapons, but classified testing done to devise countertactics to enemy weapons, why do you doubt their validity? The ranges are specified. I'd also be very surprised if the large-caliber weapons that did the most damage were not tested last under this protocol. I suspect the testing started using the small-caliber stuff at longer ranges first then closing to say, 100 m with these, and recording a "pentration/no penetration" result, then doing the same with the medium-caliber weaponry, and saving the big-caliber stuff for last. If you think that your big cats getting plinked repeatedly by Soviet 45 mm guns at long ranges seriously compromises their armor integrity, then I submit to you you are more critical of their armor than I.
Hmm, Wikipedia says a mere 3:1 for the entire war, and no one disputes that that the 1941-42 kill ratios were lopsided in Germany's favor. 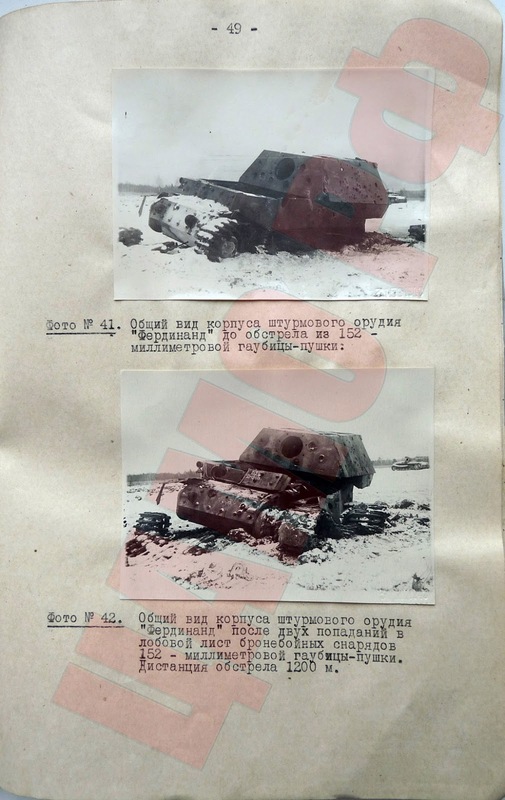 Said '10:1, 8:1, 6:1, 5:1' or whatever ratios Nazi fanboys come up with are largely derived from German totals which result from a biased counting system that counts Soviet AFV as "kills" that would be merely 'damaged' if they had swatiskas painted on them, against only 'destroyed' German AFV (and it ain't 'destroyed' even if you have to pick up the pieces and send it back to the factory to be rebuilt). Moreover, most of the reputation of the Tiger/Panther is based on their tactical usage in 1943-45, when the Germans were on the defensive. Against T-34s and against Shermans, yeah, a concealed Panther or Tiger lying in ambush could be a formidable foe and rack up a highly favorable kill ratio. However, as both the Battle for Sandomierz Bulge in August 1944 and the Battle of Arracourt in Sept 1944 showed, when it was T-34s and IS-2s or Shermans and American TDs that could be the ones lying in wait, it was easy for the Allies to rack up impressive kill ratios in *their* favor. This is especially true with the Panther and its very thin side armor and puny HE round, which makes it suffer in offensive roles and poor at being anything but an anti-tank defensive weapon. Well, one reason is that the very same Ferdinand was used to test German weapons before the Russian tests. In fact photo #40 where a large piece of the upper front hull broke off. It broke right were two penetrations were made by German 75mm/L70 APCR. The chalk '70 HEP Bp' is seen partially erased under the 'D' of the "D-1200'. What value is a test that needs the tank armor to be penetrated by the enemy's weapons before it can be defeated by your own? Uh, you inadvertently just proved my point. Note that the German 75/L70 (a medium-caliber weapon) was tested *before* the large caliber ML-20 152 mm howitzer was tested--just as I predicted it should be. That's because the impact of a medium-caliber round like the 75/L70 round would degrade the overall armor integrity of the target less than the impact of the 152 mm round. c) then finish up with large caliber rounds. As "why did they use the same vehicle for all the tests?" I suppose that you'd want a fairly pristine, non-burned out, captured vehicle for the testing, because otherwise you'd be doing the test with already-compromised armor (the heat from being burned out anneals the armor). As it was standard German practice to blow up any tanks it had to abandon, I'd say that getting such a pristine vehicle would be a rarity. So you make do with what you have. That's because the impact of a medium-caliber round like the 75/L70 round would degrade the overall armor integrity of the target less than the impact of the 152 mm round. That may be the reasoning but the execution was poor. If you want to find the effect of what 'your' weapons can do, do not first use the enemy's best weapons to soften up the target. 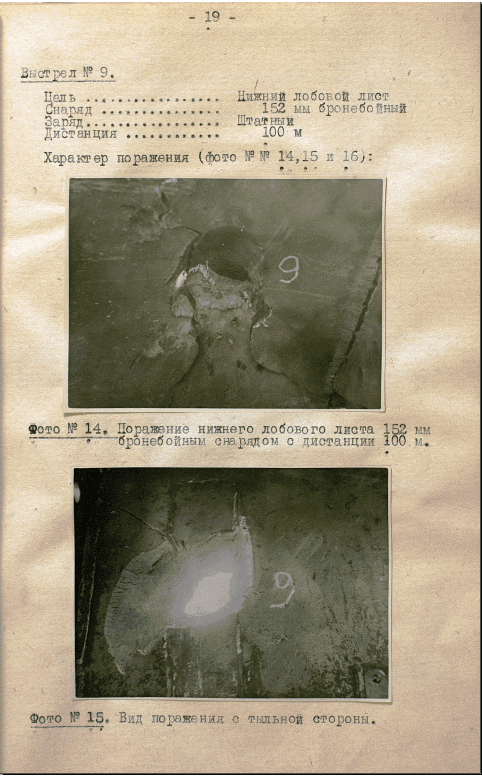 In photo #42 the left side of the upper front is not even touched by shell fire. Only the compromised right side is hit. This might result in a glowing report on new Soviet guns from the political commissar but gathers no useful knowledge. That may be the reasoning but the execution was poor. If you want to find the effect of what 'your' weapons can do, do not first use the enemy's best weapons to soften up the target. You may have a valid point on the execution; it would have been better to direct any new incoming fire to an unhit side. But as a practical matter, it's just a fact that tanks go through their service life getting pinged by various caliber rounds? In the tank museums I have visited, the captured WWII German tanks exhibit all sorts of 'ding's and divots from rounds that ricohet'ed or didn't penetrate. No doubt some of these weakened the armor in that immediate location. The way that the Ferdinand was used (or more rightly, mis-used) at Kursk as assault guns, most would have suffered plenty of such 'dings' from Soviet guns of various calibers. So even your objection, while it has merit, does not represent some totally unrealistic scenario. What puzzles me over these objections to these tests that match results that were both a) observed in actual combat, and in most cases b) predicted by theory. So what's the beef? Even when not predicted by theory, a big problem with WWII German heavy armor in general was, as a friend with some knowledge of the subject observed, was that the Germans kept trying to manufacture AFVs with thicker armor than 1940s welding technology could keep together when impacted. That's what you see a lot of times in this Soviet testing--failure at the weld joints. it's just a fact that tanks go through their service life getting pinged by various caliber rounds? I wouldn't call being twice penetrated in close proximity by 75mm APCR through 200mm of armor as being 'pinged'. So even your objection, while it has merit, does not represent some totally unrealistic scenario.It turns out it did from that point on. The Germans never again used the Ferdinand as a break-through vehicle. They used it mostly for long range sniping. Soviet contingencies for knocking them out with short ranged 45mm AT guns was for naught. What puzzles me over these objections to these tests that match results that were both a) observed in actual combat, and in most cases b) predicted by theory. So what's the beef? I don't know if all things observed were recorded and what theory are you going by? -In theory, theory and practice are the same. In practice they are not. was that the Germans kept trying to manufacture AFVs with thicker armor than 1940s welding technology could keep together when impacted. Actually, that happen even to more modern tank welds. It is because of the shock affect that causes the plate to flex away from the weld. In a case two M48's accidentally collided in Korea in the 1970s where the entire front armor casting of one M48 broke off from it's welds and fell away. Well, in practice, these tests had little purpose, as the vast majority of Ferdinands were destroyed by mines, infantry, or terrain. Turns out a machinegun and reasonable mass are much more important for a tank than a huge gun and thickest armour. It would be interesting to find if the Elefant ever once used it's machinegun on any infantry. As usual, you missed my point...if the objection was "it's only an 'objective' test if one shoots at a completely undamaged tank". Any round hitting the tank has the potential of weakening the armor for a subsequent round. It turns out it did from that point on. The Germans never again used the Ferdinand as a break-through vehicle. Irrelevant from the perspective of considering armor testing in general. AFV that gets used in combat gets dinged. You see pictures of tanks with dings and you can see dings on tanks in museums. Armies don't remove a tank from service because of such dings, they keep using them. Given the fact that obtaining suitable non-burned out tanks, let alone "pristine" tanks, for testing isn't common, so that you have get the most for your money when you do get a specimen, it's not an unrealistic test to shoot at it more than once. FACT: The Soviet 152 mm ML-20 actually could and did take out Elephants in real, actual combat. That's why the SU-152 got its nickname. The tests above shows that they could do this on the target field too. Practice (combat results) and theory (test results) agree. You have been claiming the test isn't "right" or "fair" even though the test results matched the results of actual combat. Actually, that happen even to more modern tank welds. That may be true as well, but the German heavies of 1944-45 in particular were better armored on paper than they were in real combat, because of weak joints. So It looks like that 152 mm AP was more effective against Ferdinant hull front armour than D25 AP amunition but was worse at very close distance against Tiger II hull front than kwk 43, BS 3, D25 Ap and even D25 HE?! All made up by slavic insects. Russian motherfucks r inferior in race. They couldn't possibly engineer anything as that would require some brains. YOU ARE AN IDIOT. RUSSIA MORE OR LESS WON WW2. THEY KILLED MORE GERMANS AND AXIS FORCES THEN THE REST OF THE ALIES COMBINED ( OR CLOSE TO IT.) THEY DEFEATED AN INCREDIBLY LARGE JAPANESE ARMY IN MANCHURIA. THE RUSSIANS SUFFERED GREAT LOSS, STARVATION, BRUTAL WAR CRIMES, Freezing TEMPUTURES, AND THEY STILL DEFEATED THE ELITE OF THE GERMAN ARMY. IF GERMANY EVER BUT DOWN THERE DIFFERENCES WITH RUSSIA AND FOUGHT TOGETHER THEY WOULD HAVE WON THE WAR AND RULLED ASIA, EUROPE, AND POSSIBLY EVEN AUSTRALIA AND AFRICA NO QUESTIONS ASKED.